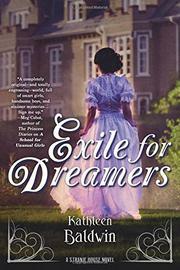 This Regency-era romance set in 1814 England features students who attend Stranje House, an establishment for girls with unusual talents. Whether it is Tess with her prophetic visions, Georgie with her aptitude for math and science, or Sera and her perfect recall, all the young ladies receive instruction that prepares them less for a life of high society and more for a life of espionage. Their skills and training are sorely needed in war-torn Europe. But even with her focus on saving the world, Tess still has plenty of time to think about the handsome and interminably frustrating Lord Ravencross. Unfortunately even with her visions, Tess cannot predict how they will ever be able to defeat the evil Lady Daneska, who seems determined to bring only pain and misery to the residents of Stranje House. The richly detailed setting and intriguing alternate history are well-crafted, but the characters are what stand out. Narrator Tess is headstrong, melodramatic, and awkward, but she is also brave, bright, and completely real. Such secondary characters as Indian Maya and Chinese Madame Cho provide some diversity.